No need to fuss with pastry! Turn flour tortillas into cinnamon-sugared crispy cups, then fill with whipped topping and fresh fruit. This is one of those dessert recipes you'll make again and again. MELT butter and brush both sides of flour tortillas. MIX sugar and ground cinnamon in a small bowl. Sprinkle each tortilla side evenly with sugar mixture. GENTLY press tortillas into 6 custard cups to form cups. Microwave 3 cups at a time on HIGH for 45 seconds. Let cool five min, before removing from custard cups. Repeat for remaining cups. Set aside until needed. STIR rind from one medium orange into thawed whipped topping. 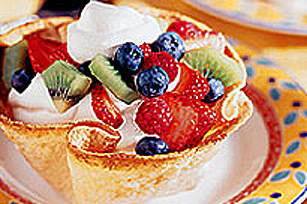 FILL tortilla cups with whipped topping and assorted fresh fruit. :Any small microwavable bowl can be used to make tortilla cups.